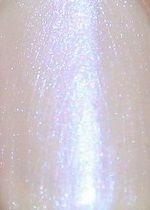 OPI Nail Polish, Altar Ego, NLS78, .50 fl. oz. Sheer light pink nail color with strong iridescent violet blue micro-shimmer that gives a subtle duo chrome effect. OPI Sheer Romance Bride Edition collection, Soft Shades.